Modern Warfare 3 Review | The Fighting 1:18th! What is the biggest video game franchise in the world? Of course it’s the Call of Duty series! This past November they released their newest edition “Modern Warfare 3”. Activision has made a habit of releasing their new game every year around Veteran’s day. Million’s of people get in line at midnight to buy a game that they have had pre order for months so they can run home and shoot each other online. 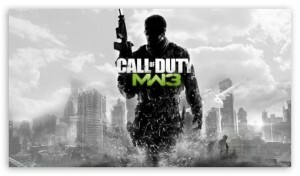 This year MW3 eclipsed 1 billion in sales in just 16 days!! I was one of those silly people waiting in line at my local GameStop so I could grab a copy right at midnight. I ran home, installed the game onto my PS3, texting my buddies who were doing the same and plotting my first session of team death match. MW3 like the games before it has a very interesting storyline in campaign mode, however like the games before it, everyone wants to focus on the multiplayer. In this quick review I will cover all phases of this first person shooter. First lets start with my favorite game mode. The Spec Ops is my favorite for many reasons. It takes the campaign and jumbles it up and lets you do co op missions with a friend. The goal is to get 3 stars on every mission with each star adding a degree of difficulty for a total of 48 stars. If you played MW2, your familiar with it. One of my best friends and I love doing co op games and we thrive in this mode. They have added a secondary Spec Ops mode now which is a survival mode much like COD: Black Ops’s zombie mode. You survive wave after wave of enemies which of course gets harder as you go on. You start with basic soldiers coming at you and then they upgrade with armor, better weapons, helicopters, dogs etc. It’s way more fun playing against actual soldiers and vehicles instead of zombies. You also now have your own ranking system in Spec Ops and your own currency. You can buy perks in-between waves like a Delta Squad, mines, weapon upgrades etc. My favorite technique would be to lock myself in a room with only one or two entries. I would then load the door ways with mines and a sentry gun, camp out and blast my enemies. The game gets pretty crazy in the higher waves with Juggernauts who are equipped with riot shields come flying in and while your trying to take them down, you have a dog with a bomb strapped to his back biting your ankles… Fun stuff. Next: 1:18 Starcraft figures coming from Unimax!